Ever wondered what it’s like to experience a religious epiphany? Just walk into Gallery 6 and look to Francisco de Zurbarán’s St. Francis of Assisi in His Tomb, one of the great masterpieces in the Museum’s Collection. St. Francis towers above us in a massive, stark painting, lit only by unseen torchlight, his face hidden and a skull cradled in his palms. The space is unclear, the colors muted. He is monumental, and walks towards us: his foot pokes out of his robes, entering into our space. When I stand in front of this painting, I always feel like I should take a step back and get out of his way. What’s really cool about this painting is that it shows a story within a story. St. Francis lived in the 1200s and was a young man from a rich family. At 21, he renounced his wealth after a religious epiphany, choosing to live a life of poverty and chastity, and eventually founded the Franciscan Order of Christianity. 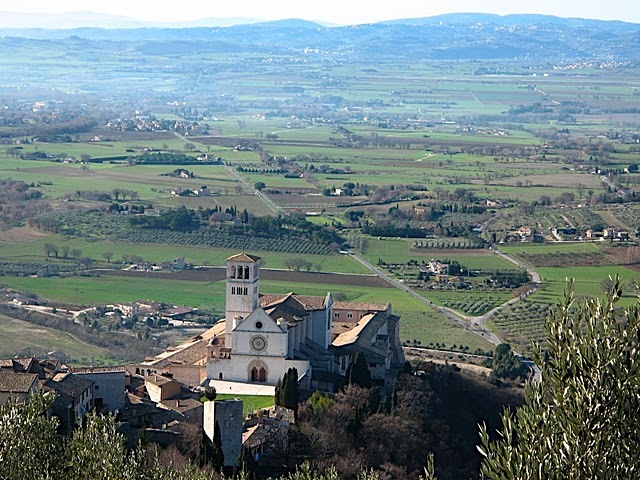 In the 1400s, Pope Nicholas V visited the tomb of St. Francis at Assisi at the Basilica di San Francesco (right), and had his own vision–he saw St. Francis with the stigmata, as if he’d never been entombed, walking towards him. 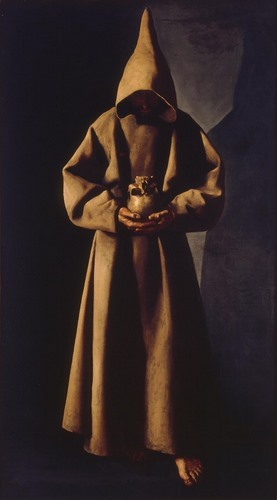 Zurbarán shows this moment, specifically: as if we are Pope Nicholas V, seeing the dark, otherworldly, but also remarkably realistic image of St. Francis slowly walking towards us in the flickering torchlight. If you really want to put this painting in context, look no further than YouTube or Netflix. In 1972, Italian filmmaker Franco Zeffirelli directed the biopic Brother Sun, Sister Moon, focusing on the life of St. Francis. You can watch a great clip of the scene of his conversion below–in which he renounces his family wealth–or rent the movie to see the whole story of St. Francis’ life. This entry was posted in Art and tagged Baroque, Francisco de Zurbaran, From the Collection. Bookmark the permalink.